We reduce the harm caused by tobacco and secondhand smoke among Somali and East African children, youth, and adults through innovative community awareness and health education activities to change social norms around tobacco use. The East African Smoke-Free Program collaborates with the East African community and property managers to assist in the implementation of multi-unit housing smoke-free policies as well as smoke-free community gathering spaces. Community Health Workers engage residents in outreach, surveys and health education to heighten awareness of risks involved with tobacco use and smoke exposure. The program also works with large events to adapt a tobacco free policy to maintain a tobacco and smoke-free event. 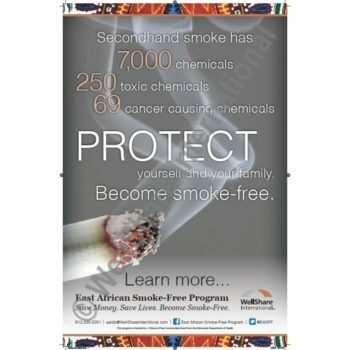 The East African Smoke-Free program is a multi-year project. This program started February 2013 and has continued as the East African Smoke-Free Program team maintains the implementation of tobacco and smoke-free policies. We are pleased the program has received positive responses to tobacco-free health education and outreach efforts from the East African community. ‌WellShare’s East African Smoke-Free Program is funded by the Minnesota Department of Health’s Tobacco Free Communities Grant. Click the video below to view our full list of EASFP videos available on our YouTube channel!